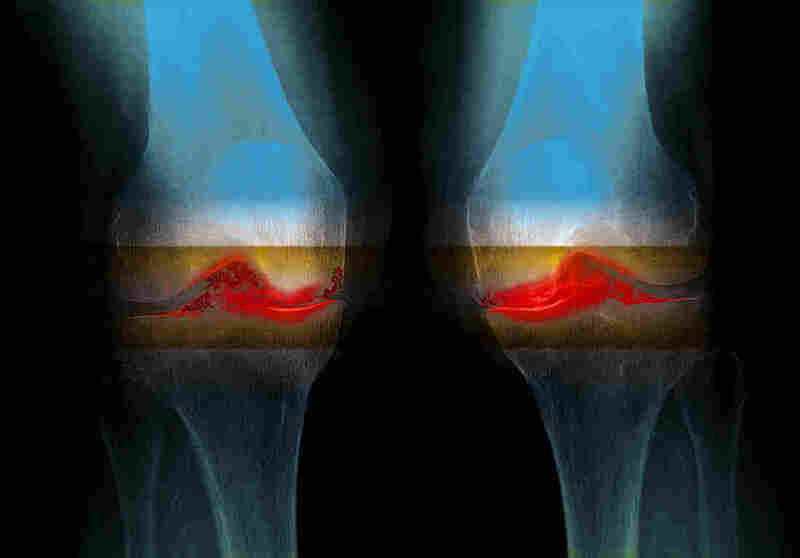 Osteoarthritis Is Much More Common Now Than In Ancient Knees, Study Suggests : Shots - Health News Even after a Harvard team took into account differences in age and weight among ancient specimens and knees today, they found that modern humans tend to have more osteoarthritis. Arthritis is a joint disease that can cause cartilage destruction and erosion of the bone, as well as tendon inflammation and rupture. Affected areas are highlighted in red in this enhanced X-ray. American doctors have been noticing an increase in osteoarthritis of the knee. They have suspected two driving forces: more old people and more people who are overweight. A study published in this week's Proceedings of the National Academy of Sciences argues that's far from the whole story. Even correcting for body mass index and age, osteoarthritis of the knee is twice as common now as it was before the 1950s. "That's an incredible difference," says Daniel Lieberman, a professor of human evolutionary biology at Harvard University and co-author of the study. Lieberman started wondering about arthritis a few years ago as he was compiling a list of diseases that modern humans aren't well-adapted to cope with — such as heart disease, lower back pain and nearsightedness. "I wanted to include arthritis in the list, but realized that there wasn't any good data," he tells NPR. So Lieberman asked Ian Wallace, a postdoctoral research fellow in his lab, to fly around the country and study human skeletons that had ended up in museums or had been donated to medical schools for scientific research. The skeletons were from people who died as long ago as 4,000 B.C..
"The oldest specimens that we looked at were some skeletons from prehistoric Inuit hunter-gatherers from Alaska," Wallace says. The most recent were the remains of people who died in Tennessee in 2015. Conventional wisdom is that osteoarthritis of the knee results mostly from wear and tear, which is why, these days, it's more common among older people and those whose excess body weight puts extra stress on those joints..
That's not to say that exercise fully explains the trend that the Harvard researchers have noted. "There may be dietary factors that may be important," Loeser suggests. And sports injuries, which he says "have become more and more common" may be contributing to arthritis, too. As Lieberman and his colleagues try to figure out exactly what's behind the problem, they're hopeful that a lot of what's driving it may be preventable.